Co-skipper on Tokio and Mari Cha IV, he was first mate on board Geronimo with Olivier de Kersauson when they broke the record of the round the World Jules Vernes Trophy in 2004. 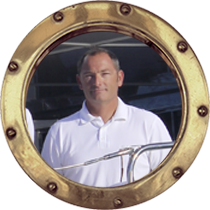 Steeped in the culture of racing sailing yachts, Franck is equally comfortable in command of sophisticated charter yachts and continued his career as Skipper of very popular charter yachts such as Django Too, Rose of Jericho and the classic Tuiga, flagship of the Monaco Yacht Club. 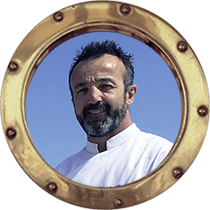 Now onboard Ipharra, he looks forward to sharing his extensive knowledge of the best anchorages and sailing grounds of the Caribbean and the Mediterranean. Franck is committed to safety and will enjoy taking you to a new thrilling experience on board this splendid catamaran. Cyril has worked at very notable hotels and fine dining restaurants including 4 years in a 3 stars Michelin rated restaurant in Narbonne France. He has gained a vast amount of knowledge about worldwide cuisines and techniques and enjoys putting them together to create unique and exciting dishes. Cyril delights in making the most out of fresh local ingredients and will be at the markets first thing in the morning to bring the best to your table. He specializes in healthy and fresh cuisine which is delicately prepared and beautifully presented to ensure your culinary experience on board Ipharra is an absolute highlight. While Mediterranean is his expertise, he can cater to any dietary requirements, including Asian, Kosher and diabetic. Cyril is happy to pleasure high standards guests, developing a tailor made service and delivering something special with a fresh, creative and tasty cuisine. He likes rugby, Sports, Swimming, Read, walk in the countryside, cinema, theater. 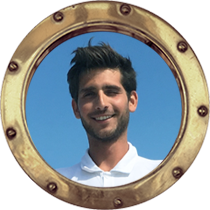 After studying Marine Engineering in Sète Merchant School, François started his career in the marine industry working aboard numerous sailing yachts and motor yachts in South of France, Greece, the Adriatic Sea and Turkey. François joined the team on IPHARRA in 2017 and embraced the challenges and rewards of maintaining all her systems in top working condition. François is a professional, self-motivated individual who brings with him a lot of experience. He is a fun loving personality and is very much looking forward to entertaining you on your stay with all our water-sport based activities. In her prior career in hospitality management in 5 Stars Hotels in French Polynesia and Costa Rica, and event Management in South Africa for the World Cup, she brings knowledge from all over the world. Smiling and enthusiastic she really enjoys her job and provides a high-quality service aboard. 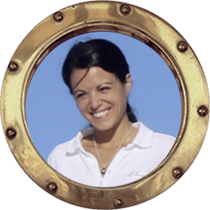 Heilanie has been working 3 years as stewardess in French Polynesia, Caribbean and Mediterranean aboard yachts as MY LA DEA II 49 meters, SY MAGIC CAT 25 meters and MY LATITUDE 52 meters. She has also one crossing experience on fast sailing catamaran from Martinique to Marquesas. 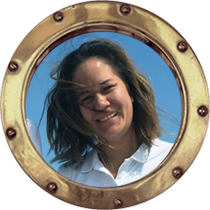 Heilanie is aboard IPHARRA since June 2016, her kindness and her high sense of human relationship are very appreciated by the guests. She is a perfect stewardess and a real hard-worker.